St. Apollinaris was born in Antioch, a Roman Province of Syria, now modern day Turkey. 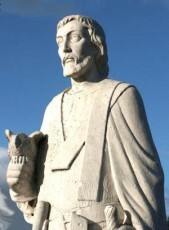 He was born around the time of St. Peter, and is believed to be around the same age. He was the first Bishop of Ravenna, and was made Bishop by St. Peter himself. He faced nearly constant persecution, and he and his flock were exiled from Ravenna during the persecutions of Emperor Nero. He was noted for performing many miracles, and as he wrought more and more of them, he soon attracted official attention. Between his performing miracles and preaching, he won many converts to the Faith, while at the same time bringing upon him the fury of the idolaters, who beat him cruelly and drove him from the city. He was found half-dead on the seashore, and kept in concealment by the Christians, but was captured again, and compelled to walk on burning coals before being expelled a second time. Despite the horrible tortures, he remained in the area and continued to work evangelizing the people. Records show us that he then journeyed to the province of Aemilia. A third time he returned to Ravenna, was captured, cut with knives, scalding water poured over his wounds, was beaten in the mouth with stones for preaching, and chained in a dungeon to starve to death. He was released and sent to Greece. There the same course of preachings, miracles, and sufferings continued. After every attempt to silence him failed, he was sent back to Italy. For the fourth time he returned to Ravenna. By this time Vespasian was Emperor, and he in answer to the pagans, issued a decree of banishment against all Christians. St. Apollinaris was kept concealed for some time, but as he was passing out of the gates of the city, was captured and savagely beaten. He lived for seven days, telling the Christians that the persecutions would increase, but that the Church would ultimately triumph. He died when a sword pierced his heart, and centuries after his death he appeared in a vision to Saint Romuald. He was one of the first great martyrs of the Catholic Church. It is not certain that he was one of the seventy-two Disciples of Christ, but it is suspected. The precise date of his consecration as Bishop cannot be found, but he was Bishop of Ravenna for twenty-six years. St. Apollinaris was friends with St. Peter, if not Jesus while he still walked the earth. He knew that by staying in Ravenna preaching and performing miracles, he would be continually beaten and tortured. He returned four times, only to be tortured, beaten, and martyred. He knew that the Church would be triumphant, and with that knowledge, he had to do his part. We only have the Church and our faith today, because of the many saints that have gone before us, like St. Apollinaris, who were willing to lay down their lives for the Church. The least we can do is use all of our power to help bring that faith to others that are searching for the truth.